I just made THE MOST scrumptious salad that I've ever had. I called it the "Somewhere in the Forest" Salad because that's exactly what it tasted like. How did I manage to make it taste like a forest, you may be asking. Well, I just thought of what a forest might make me feel like and what sort of mood it brings out and kind of tried to implement that into the ingredients I chose. Oh, yes! My dear ingredients! They really were the reason this salad tasted as it did. I really was looking for something different and that's just what I got. 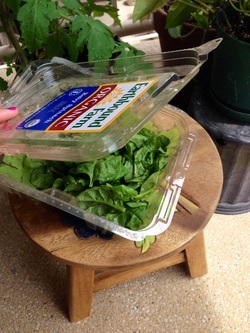 First, I toss in my beautiful greens(spinach) glistening with drops of water(from being washed). Then I sprinkle some cranberries for a more chewy texture (though I realized while actually eating the salad, that they were more like "background berries"-they didn't really stand out). Next, I got pretty creative and made some "kiwi garnish" (basically a mashed-up kiwi) to add a sort of tangy adventurous taste to the mix. It definetly paid off. 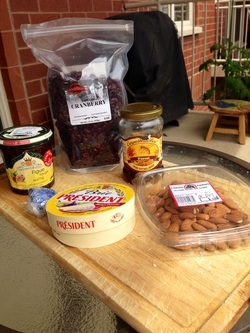 Of course, I took out my handy-dandy go-to nuts, the dear almonds. Always there to add the 'crunch' I'm looking for. I was really hesitant when it came to drizzling the Forest Honey over my so-far salad, yet I brought my self to do it, and it provided an amazing depth( being a richer, darker, and sweeter honey) as well as nicely complementing the cheese-coming up next). By now, I was at the ending stage of my salad, deciding on final touches. This is where I really thought about what I was trying to get out of this salad: depth. So, I took out the Bleu cheese, something to give my salad a more intense, deep taste- I definitely didn't want to miss that when making a "forest" salad. But, I really was careful not to put too much. After all, the cheese was supposed to be a finish-note, not a dominating flavor. My final touch was a small slice of brie( for its creaminess) coated in fig jam( very "foresty" and seeds added great texture). My ending product: an amazingly flavorful, textural, and plain-out delicious salad that I was proud of. Plus, I really got the depth I was looking for and the salad tasted just like a forest. Every bite was an adventure and I felt good about eating it. A definite success for lunch! 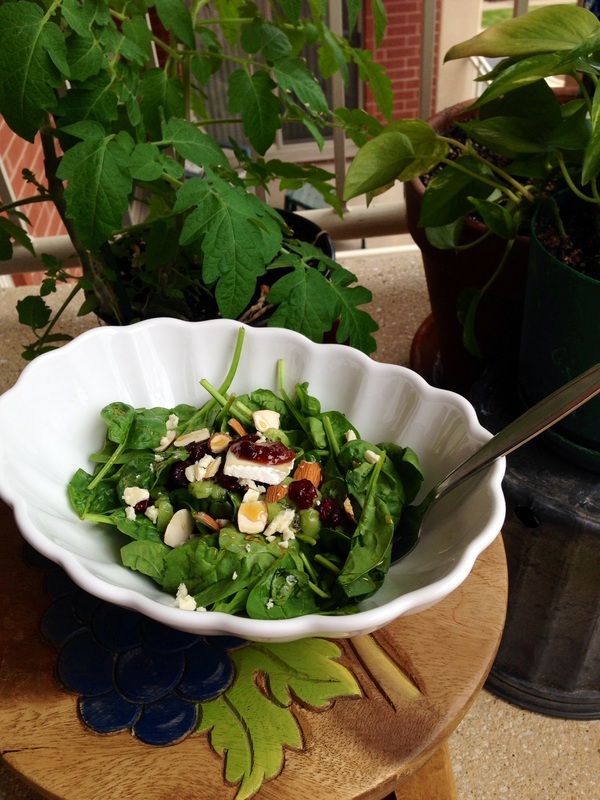 SOOO creamy, crunchy, chewy, juicy, sweet, sour, & yummy all in 1 salad! Throughout this week, I've been experimenting-seriously. I've mixed up some really good food...and bad. I've tried a bunch of things that made me smile...and others that nearly made me barf. But now I know what I like, what works for me, and what not to eat, so it definitely paid off. 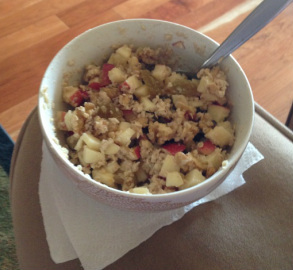 Above: Loaded Oatmeal ( containing oatmeal, apples, walnuts, almonds, raisins, and honey)-this thing had 600 calories...in a breakfast! Above: Cherry-Almond-Honey Oatmeal (containing oatmeal, cherries, almonds, and honey-about 270-300 calories...more than half the calories in the loaded oatmeal...and a regular breakfast amount. The Cherry-Almond-Honey Oatmeal was by-far-better looking and tasting. Plus, I didn't feel like a balloon after I was done eating. And since for me, it is about eating the way I want to feel, I felt a lot better after eating this oatmeal versus the loaded oatmeal. Honestly, I wasn't aiming for a loaded oatmeal. I just got carried away in all of the ingredients and it happened. And I did use a bigger bowl for the loaded oatmeal so I also ate a bigger serving size. *measure it out- it might seem tedious at first, but even though you may be using healthy ingredients, they have a limit too. It's easy to stack on calories when your slicing in a whole apple and throwing in as many nuts as you can find-check the serving sizes of your ingredients and try following them. 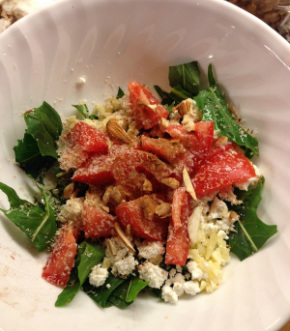 Above: Hit-the-Mountain Salad ( contains dandelion leaves, tomatoes, feta cheese, garlic, almonds, cinnamon, olive oil, and honey)- big mistake: garlic and dandelion leaves clashed- WAY too strong. 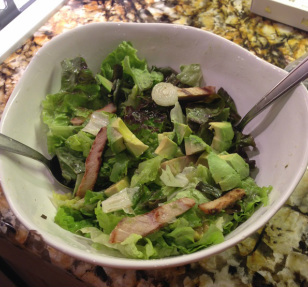 Above: The-Green-Pig Salad (contains lettuce, pork, green onion, avocado, oil, and vinegar)-very tasty! Avocado was very creamy, green onion was crunchy, and the pork gave the whole salad a very pleasantly- porky taste. The-Green-Pig Salad was fantastic! So much more fantastic than the Hit-the-Mountain Salad. The garlic was a horrible choice-without it, the salad would have actually tasted pretty good. The avocado in The-Green-Pig Salad was bliss as it melted in my mouth and helped other flavors of the salad shine, like the pork. *don't over-do: sometimes you really don't need a final touch-that "final touch" can mess-up your whole master-piece, so be careful. *feel free to add texture- it can change the whole feel of a salad. Just make sure that your texture-arousers have a nice taste too! *choose your ingredients wisely- before you add anything else to your salad...PAUSE...do you really need this ingredient? What will it do to your salad-help or hinder? And if you decide that you want the ingredient, don't pour it all in at once. Put a little, and then see if you like it or need any more. Overall, it was fun experimenting and I'm glad that I did come out with some good outcomes that are on my yummy-line (both healthy and tasty). Yesterday, I went to my first sushi place and I have one word to describe it- amazing!!! Now, I don't go to sushi places everyday...but would there be a problem if I did? So I decided to do a little research. I sought out to find the answer to my question: Is sushi really that bad for you? Not really-it contains all sorts of great things like seaweed, fish, and vegetables. So why isn't sushi exactly a go-to "healthy" food. The main culprit here is rice. Precisely, enriched rice. No matter the type, all sushi is a rice-based. 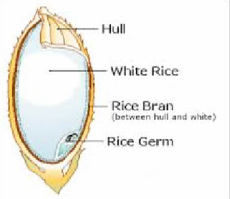 The problem is not the fact that it's rice-based, but the fact that it's enriched rice. This "enriched" rice is basically brown rice stripped of all its natural nutrients and instead Vitamin D is added so that the rice is not completely "nutritionless". Caption: Everything besides the white rice is taken off. Oh well! 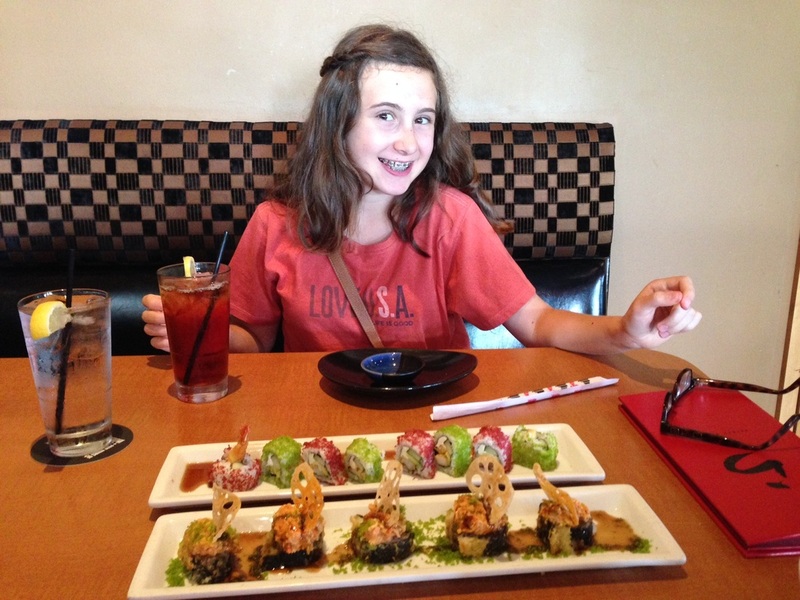 My taste-buds still love sushi. Recently, I've been experimenting with all types of foods that taste good to me and are healthy. I call this 'finding my yummy line'. Everyone's got his/her own yummy line based on his/her tastes and his/her body's needs. I've just discovered that my yummy line lies somewhere near cottage cheese. Of course, you might hate cheese in general- I don't know that. That's why I don't consider a yummy line something general. But if you don't hate cheese and are not lactose-intolerant, cottage cheese might be something you'll want to look into. Personally, I'm not a big fan of eating plain cottage cheese solo. That's why I tried combining cottage cheese with other ingredients that are usually a go-to for me. Not every one of my experiments turned out so great-like cottage cheese and peanut butter-but I did have some big winners. 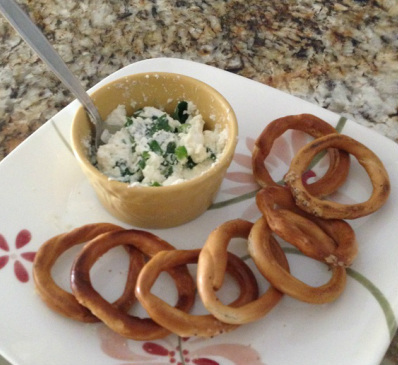 For example my cottage cheese, chive, and dandelion leaf pretzel dip. That was the best replacement for nacho chips and canned salsa I've ever found. It might sound really complicated but that's only because I literally listed all of its ingredients in its name. You might also be thinking how in the world I came up with this crazy dip idea. After doing my morning workout, I was really craving something dipable. The only 'official dip' we had in my house was a jar of salsa. I was thinking, 'Oooh! Salsa's not that unhealthy. I think I can make an exception. Now, I just need to find some chips.' By chips, I strictly meant tortilla- I wasn't planning to regain all the calories I burned. And yet, the only chips I find is a bag of nachos-the really flavored salty ones. So at that point, I just drop the whole salsa idea. But I don't drop my crave. I go through my fridge and pull out some cottage cheese-sounds dipable, I guess. I pull out some chives for flavor and my hand comes across dandelion leaves(!). So I mix everything together and then I realize I need something to dip in the dip. I already know I'm out of chips...so I get creative-pretzels! AND, at the same time, found something in my yummy line. Al- an active little lady who wants to get her healthy ideas 'out there'.